1. Preheat the oven to 180°C, gas mark 4. Heat the coconut oil and the maple syrup in a small saucepan for about 3 minutes. Place the oats, pumpkin seeds, sunflower seeds, linseed, coconut and spices into a large bowl, tip over the melted coconut oil and maple syrup and stir well to combine. Tip onto a large, flat baking sheet and press into a single layer. Roast in the oven for 30-35 minutes until golden and toasted. Stir occasionally to toast on all sides. Remove from the oven and leave to cool. 2. Place the pomegranate juice, sugar, 100ml water and the vanilla pod in a medium pan and slowly bring to simmering point, allowing the sugar to dissolve. Add the plums and bring back up to a simmer and allow the plums to gently poach for 5 minutes. 3. Remove the pan from the heat and allow the plums to cool in the fridge, preferably overnight. 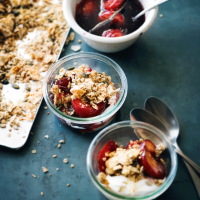 Serve with the granola, yogurt and some of the poaching liquor.